Cook brownies according to the directions on the box. Let cool for 10 minutes. Spread 2 tablespoons of peanut butter onto brownies. Set aside to cool completely. With an electric mixer, cream butter and peanut butter until smooth. Add sugar, brown sugar, milk and vanilla, and mix until smooth. Carefully add the flour, and continue to mix at low speed until well combined. Spoon cookie dough onto the cooled brownies and spread gently into an even layer. 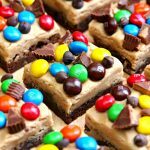 Sprinkle M&M’s, Reese’s Peanut Butter Cup pieces and chocolate chips over brownies and cookie dough. Slice into squares. Keep refrigerated until ready to serve. Store leftover brownies in refrigerator.